We open this story with HI-TECH leading a group of TECHNOGANGSTERS on a break-in at a Government Lab. The object of their quest? A PROTON ACCELERATOR, but the Turtles and Carter are there waiting for them, and after a fight scene Hi-Tech and the TechnoGangsters escape with their booty. The Turtles are ticked off at Carter because, once again, he didn’t play like a team member. Carter is angered by their criticism and takes off on his motorcycle. Back at the lair, while Leonardo is unable to locate the Dreggnaught with their tracking equipment, Donatello continues to express concern about the results of his testing of the unstable mutagen. 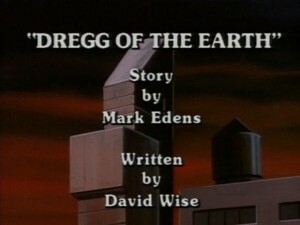 Suddenly, April contacts them to let them know that Dregg has landed on Earth and is preparing a press conference. The Turtles rush to meet April at the Park, where they hear Dregg announce his friendly intentions and offers the world his MOLECULAR CONVERTER, a device that will rid the world of pollution. To the Turtles’ utter surprise, Dregg is a welcomed hero! All that Dregg asks for in return is a base of operations, so that he can put his advanced technology to use for the good the planet. The City is more than happy to provide him with a new skyscraper, now known as the Dregg Tower. The Turtles can’t believe that this is happening! Somehow some way, they have to prove to the world that Dregg is evil. But they are unable to get inside his new building and dig up any dirt. Meanwhile, Carter, wanting desperately to prove his worth to the Turtles, makes a bogus deal with Dregg to deliver the Turtles to him. Dregg readily accepts. Only Carter neglects to inform the Turtles of this deal, and they most definitely feel betrayed when they are captured by Hi-Tech and his TechnoGangsters and delivered to the Dreggnaught. And to make matters worse, while the Turtles are strapped to steel slabs in Dregg’s Power Chamber and are busily trying to free themselves – something happens. They momentarily and uncontrollably begin to mutate. But before the Turtles can dwell on the preview of their future, Carter arrives to rescue them. After Carter convinces the TMNT that this was all part of his plan to get the Turtles inside the Dregg Tower (seeing as how they couldn’t by themselves), they embark on their mission to shut down Dregg. But during the middle of the climactic third act fight, Carter mutates, only this time the Turtles are able to witness it and April gets it all on tape. With Dregg temporarily defeated once again, the Turtles and Carter return to the lair. Unfortunately April lost her mini-cam holding the taped proof of Dregg’s real intentions, but thanks to their commonality, the Turtles and Carter are finally a team.